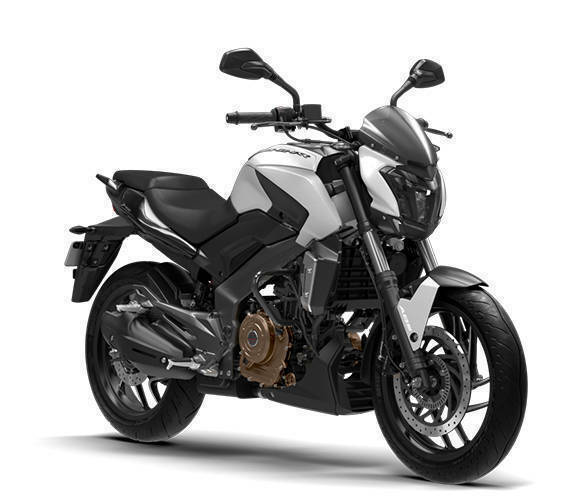 The Bajaj Dominar 400 goes on sale tomorrow in 22 showrooms around the country. Bookings are open online only, and you can reserve a Bajaj Dominar 400 for Rs 9,000 tomorrow. That's just the booking amount. The non-ABS Dominar 400 is priced at Rs 1.36 lakh ex-Delhi, while the dual-channel ABS-equipped model is Rs 1.5 lakh, Rs 14,000 more. 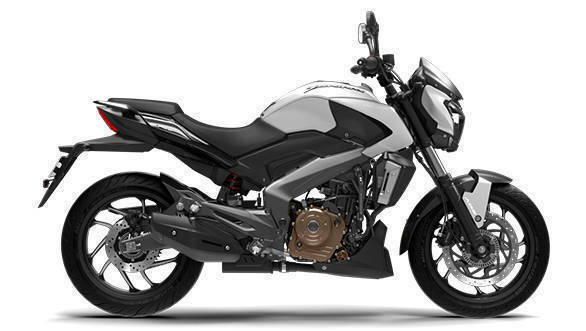 The Bajaj Dominar 400 began life as the Bajaj CS400 from two Auto Expos ago. 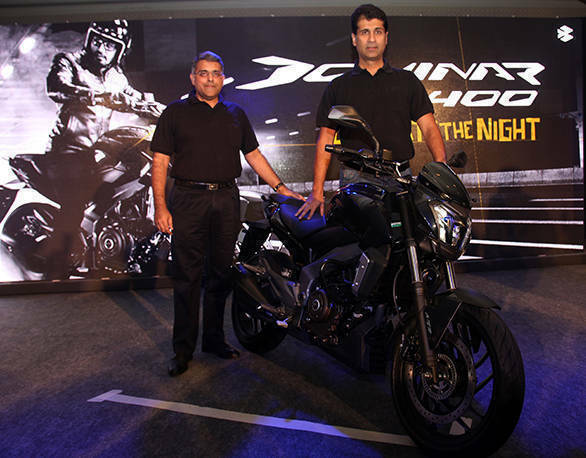 The CS stood for cruiser sports, and today Bajaj is calling it a power cruiser and it now has a name, Dominar, a completely new brand. Rumours were flying around that the bike was to be called Kratos, but Bajaj confirmed about a month or more ago that the new motorcycle will be called the Dominar 400. The amazing thing is that the difference in design and styling between the CS400 concept and the production-ready Dominar is hard to find. The bike retains the front-heavy stance from the concept, including the rounded tank and the all-LED headlight. You will notice that headlights with LEDs are increasingly called 'clusters' because they are. As we saw on the 2017 KTM 390 Duke as well as the full range of the 2017 KTM Adventure machines unlike the traditional single-reflector headlight units with conventional bulbs, the LED headlights have multiple LED units with individual reflectors that together make up the headlight. Bajaj is making a fairly big deal of the always on LED headlamps, so one assumes they will bring class-leading illumination to the segment and price class. The other design detail is the reverse LCD instrument cluster. The handlebar-mounted unit includes all the basic information including a bold rev counter and speedo plus details. More information is on a secondary display unit that is mounted on top of the tank, a la Diavel. Indeed, there are a lot of details on the Dominar 400, which are strongly reminiscent of Ducati's superhit, segment-busting Diavel. Under the skin is an engine closely related to the 373cc single-cylinder from the KTM 390 Duke. Bajaj's version gets three spark plugs and four valves with SOHC. The engine is in a relatively mild state of tune and peak power is 35PS, significantly lower than the KTM unit. But peak torque is 35Nm which is the best in the segment. The combination suggests a milder feeling engine that will not lack in performance but will operate without a sense of strain. Top speed is claimed to be 148kmph and 0-100kmph time is listed as 8.23 seconds. The rest of the powertrain is a slipper-clutch - which is more likely to be reducing lever effort and bolstering the spec sheet than actually aimed at allowing aggressive downshifting. Finally, the gearbox is a 6-speed unit. The performance should be more than adequate, but the weight is 182kg at the kerb, which is not light. The chassis is a fairly simple, basic unit and you will see why shortly. The main frame is a pressed steel twin-spar style design which ends with a steel swingarm. Bajaj adds conventional 43mm forks upfront and a rear monoshock to round out the package. The rear shock uses two multi-rate springs in series to get a wider range of spring rates. Braking comes from a 320mm front disc and a 230mm rear disc. Dual-channel ABS is available on the top model. Bajaj says the ergonomics were designed for a comfortable, easy to use package, and touring is clearly on the agenda. The footpegs are placed roughly under the knees and the handlebars look upright and wide. Definite touring potential then. The low seat height should also allow people of all in-seams to use the Dominar 400 easily. Bajaj's incredible pricing - introductory as it is - firmly puts the cat amongst the pigeons. 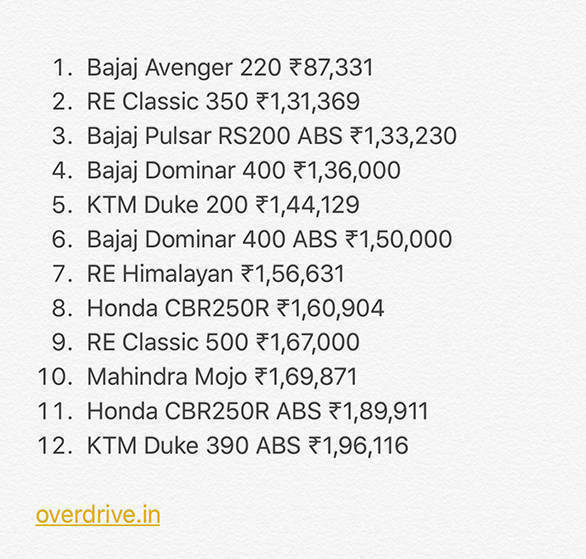 The pricing, in fact, undercuts Bajaj's own single-channel ABS Pulsar RS200! Rs 3,000 is the price jump to the Dominar. On the other side, the ABS Dominar 400 is Rs 6,000 less than the Royal Enfield Himalayan and Rs 17,000 less then the Classic 500. The non-ABS Mojo is Rs 20,000 more. The ABS Honda CBR250R is Rs 40,000 more expensive and the KTM 390 ABS is Rs 46,000 more. This is crazy-good pricing. Bajaj says the motorcycle will be in showrooms in 22 cities from tomorrow, December 16, 2016. Bookings will only be taken online and when your turn comes, Bajaj dealers will help you in the rest of the paperwork and accept the rest of the payment. Bajaj's confidence in the Dominar 400 is sky high - it believes it to be a billion dollar brand and will be relying on the bike to open multiple export markets including Europe. The Bajaj Dominar 400 presents a very intriguing combination of price and performance that threatens to upset the premium segment applecart by cutting across segments in price, performance and proposition. And now, just like you, we wait to be able to ride the new Bajaj! Here is a look at all the motorcycles the Dominar 400's prices fall close to. All prices are ex-showroom, Delhi.